The Review of Politics publishes primarily philosophical and historical studies of politics, especially those concentrating on political theory and American political thought. Thoughtful scholarly reflections on all aspects of politics - including analysis of institutions and techniques, analysis of literary reflections on politics, political interpretations of literary works, and constitutional theory and analysis - are also welcome. 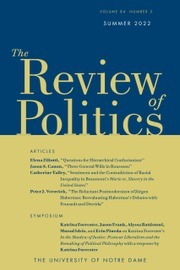 Some of the first essays advocating "realism" were published in The Review, as well as articles from its opponents in international relations; both perspectives are accepted parts of the journal's coverage.